The winners were announced live at the 2018 PEN America Literary Awards Ceremony on February 20 at the NYU Skirball Center in NYC. To the author of a book-length work of any genre for its originality, merit, and impact, and that has broken new ground by reshaping the boundaries of its form and signaling strong potential for lasting influence. To an author whose debut work—a first novel or collection of short stories published in 2017—represents distinguished literary achievement and suggests great promise. JUDGES: Mia Alvar, Rion Amilcar Scott, Justin Torres, Claire Vaye Watkins. 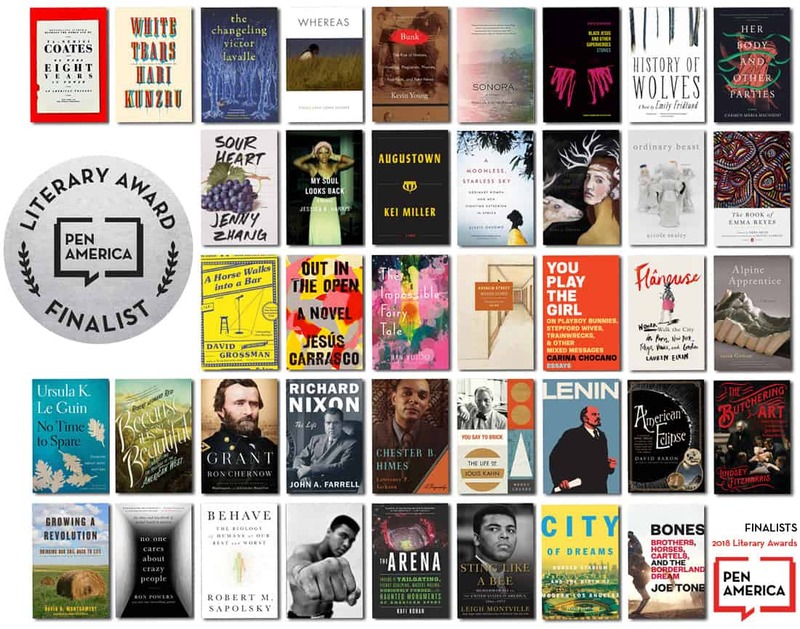 To an exceptional book-length work of any genre by an author of color, published in the United States in 2017. JUDGES: Eduardo C. Corral, Kaitlyn Greenidge, Amy Quan Barry. For a book-length translation of prose from any language into English published in 2017. JUDGES: Eric M. B. Becker, Lisa Hayden, Jenny Wang Medina, Denise Newman, Lara Vergnaud. For a book of essays published in 2017 that exemplifies the dignity and esteem that the essay form imparts to literature. JUDGES: Vinson Cunningham, James Fallows, Gillian Tett. For a distinguished biography published in 2017. JUDGES: Joe Jackson, Michelle Legro, Judith Thurman. For a book that exemplifies literary excellence on the subject of the physical or biological sciences and communicates complex scientific concepts to a lay audience. JUDGES: Luke Dittrich, Deanna Fei, Dr. Carl Hart. To honor a nonfiction book on the subject of sports published in 2017. JUDGES: Chloé Cooper Jones, Sally Jenkins, Joe Nocera.